The Gubyaukgyi has faced it all. It suffered heavy damage because of the earthquake. The Europeans even took some of the murals to grace their museums. 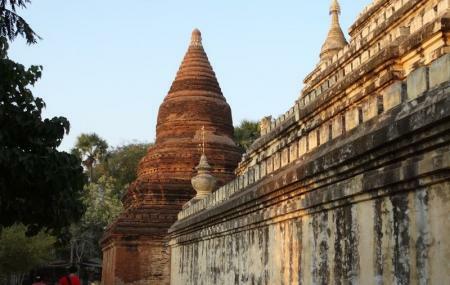 But still, this one is a popular landmark in Bagan and should be visited without any thought. Hire a tourist guide and get all the information, unknown facts and hidden secrets about this temple. Also if you want to know about the life of Buddha, then the paintings depict in the truest manner. How popular is Gubyaukgyi Temple? People normally club together Manuha Temple and Nanpaya while planning their visit to Gubyaukgyi Temple. I do not doubt this temple has a greatest paint structure with its interior walls covered with ancients culture of Art . It is one of the great temple and beautiful one.Must Visit and take photo in the evening time at the outside view and you are not allowed taking photo inside. Don’t miss the wall paintings inside the temple! You will need to use your own light to see them but they are amazing and that experience of using your flash light to look at paintings is nice too. This, and the Mahabodhi temple, resemble closely the one in Bodh Gaya, Bihar, India. This temple, hence, stands out conspicuously from the others in this region in spite of its modest size as compared to the other behemoths. There are many murals in the interior of this temple depicting Jataka tales, but most have faded. They also appear to have been a victim of vandalism. Nevertheless the serene beauty of this place is unmatched.